If you're like me, you've had it with the hearts already! I've especially had it with all the knitted hearts showing up on Flickr's Crazy for Knitting group, and I wonder, did I cause the flood of knitted hearts or was that bound to happen anyway? 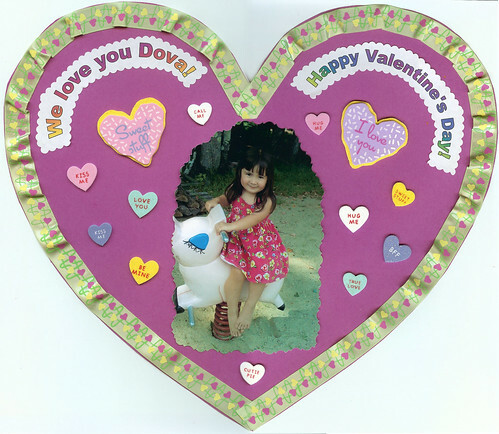 I had wanted to post about this Valentine we made for Dova, but had so much computer trouble this week (enough for a future post and a half), that I didn't get time to do it. Besides it was Valentine's Day yesterday and my husband and family were calling. But thankfully Crazy Hip Blog Mamas came to the rescue today with an excuse for me to post about it. Earlier this month, Dova came home with yet another homework assignment for parents. They wanted us to decorate this heart as a Valentine for our child using "pictures, lace, construction paper, or words". Pictures I can handle, but lace? Construction paper? Those are foreign materials for a non-crafty gal like me. I was at craft store over the weekend looking for something totally different (plastic canvas to make a tissue box holder for my car so it doesn't constantly get smashed, and I mean smashed to smithereens), and since it took me so long to locate it, I finally remembered that I also needed to get materials to decorate this heart. Dova suddenly came to life, as she had been lolly gagging around complaining that we had been walking through the store for hours. She picked out the ribbon and the foam stickers and lots of other stuff which I convinced her that we didn't need (she'll make an excellent crafty mom some day). Now decorating was quite a chore for this perfectionist engineer. Straight ribbon doesn't naturally curve. And this was the first time I've used their decorative scissors. They don't curve easily either. And I didn't even know what BFF meant until Doug told me (best friends forever). He asked whether I knew TLA meant and I said Text Link Ads? LOL, this geek is not very romantic (true love always, BTW)! In the end, the heart came out fine, and when it was tacked on the wall with the other kids' heart, I was proud of my effort. See more Crazy Hip Blog Mamas Photo Friday Valentines here. I should have made my Valentine this year....but I went for Store Bought....kind of a bummer I guess.